One of the most primary decisions to make when looking to establish a new eCommerce business online is choosing the platform on which you build your venture, and there are many. The Growing market of Content Management systems (CMS) offers an unlimited variety of eCommerce solutions that differ in scale, pricing and flexibility. While each seems to provide for different sets of needs, it seems that more and more online stores, and particularly the larger stores, choose to work with Magento. Of course, there are alternatives to Magento, which can also provide a good solid ground for building your eCommerce venture. These include many small systems, as well as WooCommerce which is a WordPress1-based solution, and Shopify. Both of these are great for small stores, and they are relatively simple to handle, but they become problematic when large scale inventory and shop customization are involved. 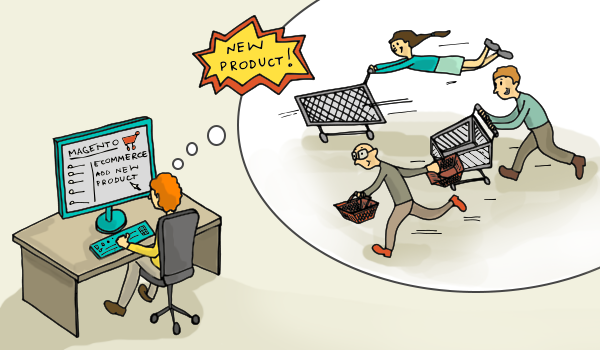 So if you wish to create a large store, Magento might be more suitable for you. Magento was first released in 2008 under the name Bento. Since then, it has switched hands and names until finally reaching it’s present owner – “eBay”. Magento has been regularly released in numerous editions, the latest one being published as recent as February 2015 – as we write these lines. 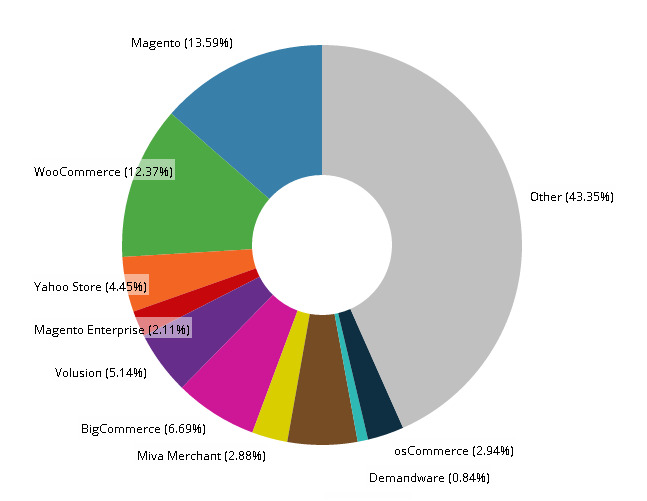 Today, according to builtwith.com, Magento’s market share consists of almost 9% of the entire internet, but when looking at the top million sites – i.e. the million sites that make the most revenue per year – we see that Magento is responsible for 14% of them. True, the success of your eCommerce venture depends on many different variations, but the infrastructure provided by the Magento CMS definitely gives a solid ground for success. The initial installation of a Magento store is almost 100% free. All you need to do is download the free version of Magento, setup your hosting (which could cost initially about $20 per year max), choose one of many free themes and start inserting your products. Magento is perfect for eCommerce by default, because it was designed for this exact purpose, so things like managing your inventory, special promotions, coupons, payment gateways and product attributes are made to include all the options you could possibly need. It is also mobile responsive and designed to cope with extensive customization. The default installation comes with all these robust tools built-in, so unless you have any specific requirements, it should be enough as a starting point. There are many themes to choose from, some are available for free and some require a premium charge. As for Magento extensions, out of all open source2 solutions, Magento includes the largest variety of possibilities for store owners, with every feature you could possibly think of already available on the extensions marketplace. These include extensions that can do just about anything: Encourage Newsletter subscriptions, add magnifying glass to product images and even turn your store into a Dropshipping Marketplace!. There are several brands that develop Magento extensions, you can check some of their online shops for solutions: CM Plugins, Extendware, Fooman and more. The immense community of developers who are already using Magento is a huge advantage that provides free support: there is no feature that hasn’t yet been developed; No problem that hasn’t yet been solved and dealt with, and all of these solutions have long ago been documented and published, so they are widely available on multiple online resources. Similarly, if you need to add a feature that is not included in your default theme, it is very easy to find it among the huge variety of extensions available for free or for sale on the Magento extensions marketplace. Along with its robustness, comes also a challenge of the system being heavy, which can be slow if not operated properly. For this reason, it is recommended to have a proper hosting. Another challenge is that sometimes, the common shop owner might find Magento a bit too complex to customize, so in cases where you want to have unique features, the help of a Magento expert becomes a cost to consider. 2Open Source In production and development, open source as a development model promotes universal access via a free license to a product's design or blueprint, and universal redistribution of that design or blueprint, including subsequent improvements to it by anyone.